You can’t always judge a volleyball player – or team – by their appearance. 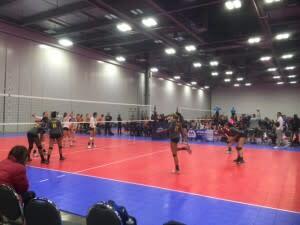 Perhaps this was the case on Sunday at the USA Volleyball Girls’ Junior National Qualifier for 18-and-under teams, hosted by the national organization’s Ohio Valley Region (OVR) and held at the Greater Columbus Convention Center. Then again, the girls on the Northern Kentucky squad are quick, tenacious, play bigger than they look, and won the championship of the Open Division (the highest classification) to qualify for the USA Volleyball Girls’ Juniors Junior Championships in Milwaukee that start April 29. The three-day tournament, held in conjunction with the Ohio Valley Region Boys Winterfest Tournament, attracted about 100 youth teams from Ohio and across the country. And, it tipped off an amazing year of volleyball action here in Columbus that will include several OVR events, the Junior Volleyball Association SummerFest in June and the NCAA Division I Women’s Volleyball Championship in December. In other words, volleyball is huge in Central Ohio. “It used to be that California and Texas dominated and were where volleyball was popular,” said Caitlin Insana, one of the coaches of Elite Volleyball 18-and-under team from Plain City, which placed third in the USA Division to earn a spot to the nationals in Milwaukee. 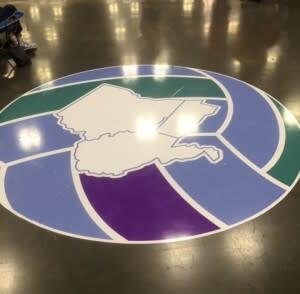 The OVR is the second largest region of USA Volleyball, said the group’sSandra Borer. The OVR has about 18,000 adult and youth players, with the majority – about 15,000 – in the girls’ youth category. “Once you get on the court and touch a volleyball, it’s so much fun and addicting,” Borer said of the sports growing popularity. The action was indeed fast and furious during the tournament, but another key to success is teamwork. “I love how team oriented volleyball is and how close we get as friends,” Coughlin said. Hentz is one of the top youth volleyball players in the country, and is headed to Stanford on a volleyball scholarship. Coughlan is headed to the University of Southern Mississippi on a volleyball scholarship. Confidence was key for Northern Kentucky in their run to the championship. “We talk about how we have to play like an underdog, but with the confidence of a champion,” Hentz said. 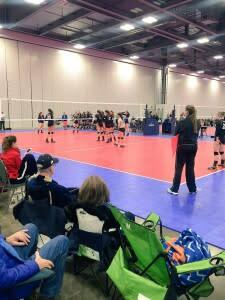 Volleyball has become increasingly popular at the college level, which means more scholarships – and more college coaches at events such as the one held at the convention center. In fact, just about all the girls on the Northern Kentucky and Elite teams who are high school seniors have earned college scholarships. “The high-caliber tournaments such as this one draw a lot of college recruiters,” Borer said. The caliber of play was excellent as Elite Volleyball took on Alliance of La Grange, Illinois for third place – and the final ticket to nationals in the USA Division. Elite took the first set 25-19. With the second set tied at 8-8, Elite gradually took control and won 25-20.